"There But for the Grace of God"
On Madam Secretary Season 1 Episode 22, Elizabeth recalls a life changing job offer while Stevie starts a relationship with Harrison on the season finale. On Madam Secretary Season 1 Episode 21, Elizabeth seeks help in dealing with her PTSD while trying to thwart an assassination attempt on an Iranian leader. On Madam Secretary Season 1 Episode 20, when a Russian nuclear submarine vanishes in American waters, Elizabeth must handle situation with the Russians. On Madam Secretary Season 1 Episode 18, a congressman is taken hostage during negotiations with a doomsday cult in Bolivia and Stevie brings home her much older boyfriend. On Madam Secretary Season 1 Episode 17, Elizabeth prepares for a national television appearance while dealing with the aftermath of Iran and drilling rights in the Amazon. On Madam Secretary Season 1 Episode 16, Elizabeth takes a secret trip to Iran in the hopes of preventing a coup that could impact President Dalton's administration. On Madam Secretary Season 1 Episode 15, Jason may get suspended for punching a bully at school while Elizabeth heads to Turkey to help political relations. On Madam Secretary Season 1 Episode 4, Elizabeth is humliated during a budget meeting when corruption is uncovered in her microloans program. 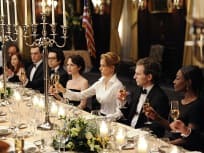 On Madam Secretary Season 1 Episode 13, Henry's father comes to visit the family and Elizabeth pushes to prosectute a diplomat who held a maid hostage. On Madam Secretary Season 1 Episode 11, Elizabeth goes to Venezuela to gain access to Vincent Marsh's secret bank account while Jackson becomes increasingly suspicious of Elizabeth's behavior. 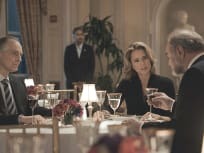 On Madam Secretary Season 1 Episode 10, an Iraqi translator threatens to reveal damaging details from Elizabeth's past in the CIA while Matt meets Win for the first time. 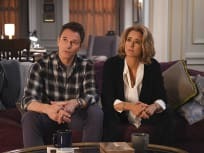 On Madam Secretary Season 1 Episode 9, Elizabeth, Henry and Isabelle begin a covert investigation into the plane crash that killed former Secretary of State Marsh. On Madam Secretary Season 1 Episode 8, a plane carrying a US operative goes missing while Henry decides to continue working with the NSA behind Elizabeth's back. 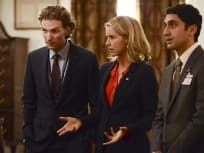 On Madam Secretary Season 1 Episode 7, an earthquake fractures the US and India relationship, which Elizabeth must repair while Stevie suspects Henry of having an affair. Elizabeth helps one of Henry's former professors when his family in the Republic of West Africa face ethnic genocide, but his lack of complete honesty creates problems for her on Madam Secretary. On Madam Secretary, Elizabeth must identify who wants peace and who doesn't among her team when the threat of war between Iran and US looms. On Madam Secretary, Elizabeth has 48 hours to avert World War 3 between China and Japan while sibling rivalry creates a battleground at home. Fallout from leaked secret government documents puts an American operative on trial in Pakistan on Madam Secretary. An American embassy is under siege in Yemen, while Elizabeth faces a more personal controversy back home when her eldest daugher gets arrested on Madam Secretary. Newly minted Secretary of State, Elizabeth McCord, plays by her own rules as she negotiates for the release of two American teens being held hostage in Syria. Along the way, she discovers who she can and cannot trust. Of those 10 that came before you, how many got us into trouble, giving us something other than the facts, including leading us into war? Permalink: How Many Got Us into Trouble? Elizabeth: What do you need, sir? President Dalton: For you to fix this. Have I been unclear about that? Chief of Staff Russell: Sir. In fairness, she inherited a lot of this, including Allen Bollings. This was Marsh's agenda. President Dalton: Vincent Marsh is dead. When are you going to do your job? Permalink: Vincent Marsh is dead. Madam Secretary Season 5 Episode 19: "Carrying the Gold"